Love the blazer and the shirt!! Great look as always! Super cute look! Love the floral on floral! So many florals!! Love this!! You have a great taste in fashion! Gorgeous blouse! Flowers on flowers looks great! You look stunning on this pics :D They are very beautiful!! This jacket is amazing!! gorgeous!! i’m in love with your shoes!! Love everything about this outfit! I like how the jacket and the shirt exchange flower power. LOVE LOVE LOVE those ankle boots!! I’m LOVING everything about this!! you look wonderful..I really like the top & blazer beautiful combo! Loving all the orange in your outfits lately! This is another fabulous look! 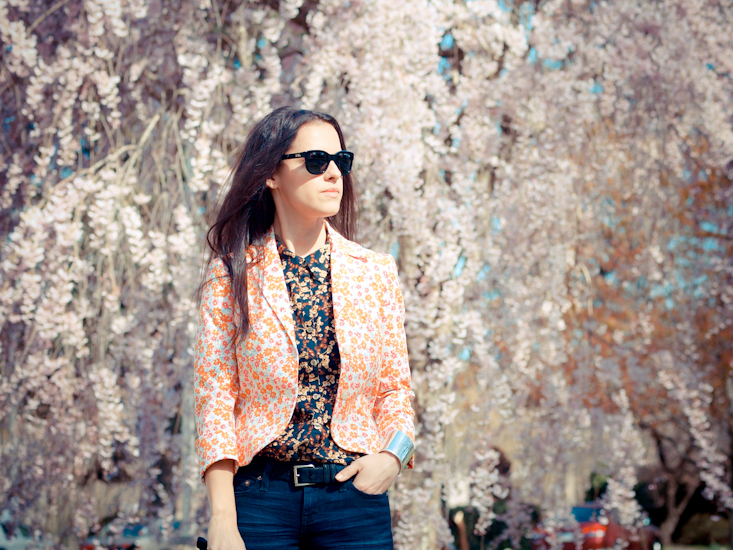 The floral on floral is perfection – this is all stunning (as per usual). Love the silver-capped heels! I’m always impress with your photos! Great style you have! Love the mixing paterns and each details of your outfit…gorgeous! following you now (I was sure I did it before), pls visit my blog maybe follow back? Gorgeous! Shoes gorgeous, stunning jacket in combination with a shirt, you are a very stylish girl with great taste, I am glad I knew you! Floral perfection!! Love the mix of the shirt and the blazer!!! floral on floral is gorgeous love it!! Ce frumos arata alaturarea de imprimeuri florale! Great look and beautiful pictures!!! Your photos are always so pretty. I love them. I love your look, floral and floral, so pretty. love your look ! amazing shirt ! Great Blog!! 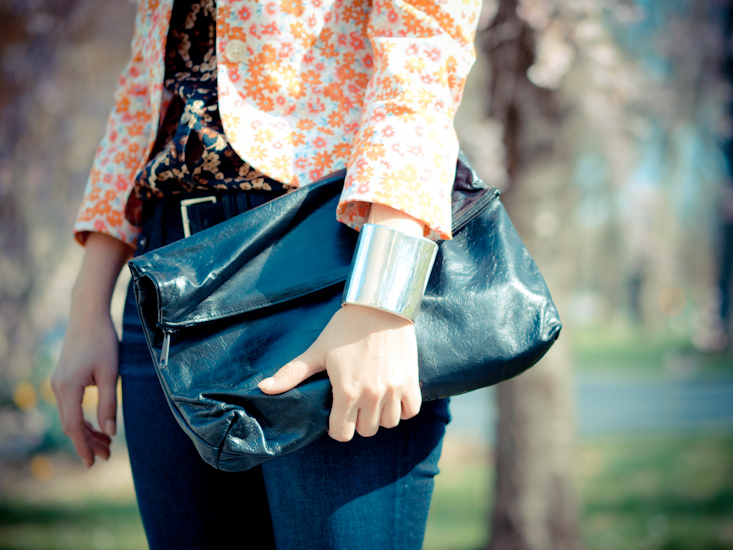 Love how chic and wearable your outfits are! Following! i love your jacket… beautiful colors!!! You look absolutely breathtaking in that outfit! I especially love the picture with the cherry tree in the background. Beautiful. Veronica, your print layering is so nice! I love floral prints, they are perfect for every season. Wish you a great w-e! i love flowers for spring! You definitely look good in floral prints. I’m liking your blazer and jeans a lot. I on the other hand, don’t look too good in floral prints. I don’t know if it cos I’m not use to looking at myself in floral prints or just that I don’t look good in it. Looking lovely as always Vero!! I love how u combined two different floral upper pieces!! 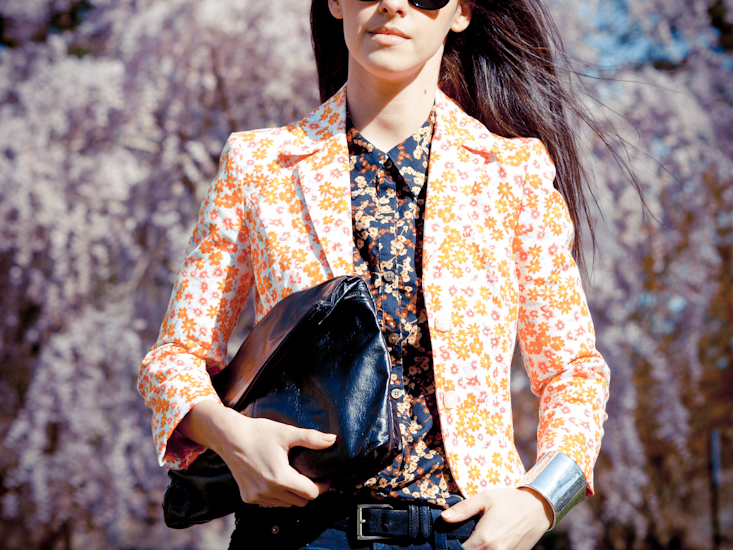 Your blouse and your jacket are to die for. oh dear, photos are beautiful! that tree is magnificent! Wow! The background is perfect! Truly divine! I love that you paired two folral print! Really awesome look! beautiful series of pictures, i find the backdrop just as gorgeous as your fashion. Total crush on your outfit.